Domain Names – Are You the Master of Yours? Over the last few weeks I’ve met several small business owners who share the same problem: they don’t have full control and access to their business Internet domain names registration. 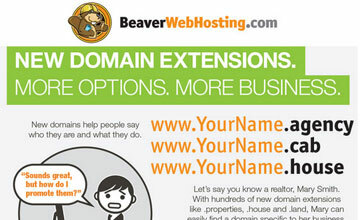 You’re not limited to .COM names anymore, there are hundreds of new extensions available now! In one case my client is the person who registered his domain names, but when he moved, failed to update his postal and email addresses listed under his account. Because it was a city-to-city move, he also changed Internet service providers, so his old email address expired. Email is the 1st choice for communication for any registration-related issues, so keep that current at all times, perhaps even use a Gmail or Yahoo! account for that. Another client I’m helping had a different situation: he originally hired someone else to build his web site, and although the web designer registered the domain names in my client’s name, it was done within the designer’s web hosting account, so my client didn’t have full access to his domains. Check your developer’s online “rating” by using this independent web site grading tool. You’re looking at a number that’s higher than 80, but above 90 would be better. Visit Alexa.com and install their FireFox Extension (you’re not using Internet Explorer I hope :-) this tool will give you an idea how much traffic your web developer’s site is getting. Serious web sites have a rating of less than 1,000,000. If a site has an Alexa rating of 1,000,000 this means there are 1 million other web sites that have more traffic, so this is a relative number — and the lower the better. Finally, check the site for Google Page Rank. You can to that easily by installing the Google Toolbar. PR goes from 0 to 10, the higher the better. Small business sites will typically have a rank of 0-2, so you’re looking for 3 and higher. Just in case you’re wondering, this blog site has PR3. N.B. this rating is per page, so be sure you’re checking the PR for the home page, as internal pages will most likely have a lower score. Next, you can check your web developer on Linkedin. This professional social networking community has high standards for recommendations, so you should check the person’s Linkedin profile. Look for the number of recommendations received, but also the type of recommendations. Click here to learn what makes a good web site, what additional tools you need to make an online presence an effective marketing tool, please come to one of my monthly seminars. Ask me how you can save 20% on tuition.